It was great to hear from Paul Nather, who just got back from Cameroon with a team from Century Baptist Church in Bismarck, ND, and shared about their trip with us. What an incredible moment to drive onto the camp property at Lake Oku and see the progress that has taken place. When the last Gateway team left three years ago, there was a 50-year-old chapel on the property. Today there are six buildings that include a caretaker’s home, a rest house, classrooms, a new chapel, a restaurant, and two rest houses. 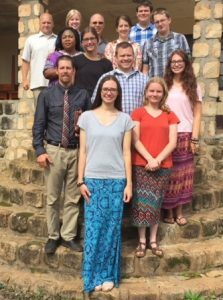 The value of the partnership between the youth of the NAB and the Cameroon Baptist Convention has created an excitement that has caused churches, conferences, and the government to get behind the project in order to see young people grow in Christ. Our team is so grateful that we get to be used to be a part of it all for God’s great glory! To find out more about Lake Oku Camp and Century Baptist’s trip, visit wewilloverflow.org. If you’ve read Executive Director Dan Hamil’s recent letter, then you’ve already heard about some of the exciting new opportunities that are ahead for the NAB. This next year will be filled with significant headway made at Camp Falcon Rock and Mbingo Baptist Hospital, as well as substantial strides in church planting and leadership development. Now is the perfect time to support the Ministry Resource Fund to help continue this momentum. Consider giving a gift before the end of the fiscal year, and if you haven’t already, check out Dan’s letter HERE. August 7, 2016—Juan Tun, Field Coordinator, Hispanics for Christ, Merida, Yucatan, Mexico. In 1987, Juan accepted Christ at a youth meeting. He began attending church and spent all of his vacations at youth camp. God guided him to study at the Word of Life Bible Institute in Argentina for five years. After that, he returned to his native Mexico because he felt a great burden for his people. His calling is to plant churches over all of southeast Mexico. He oversees church plants across the Yucatan Peninsula and partners with churches in the United States and Canada to aid in that effort. God has given him an opportunity to study administration, and his goal is to someday write a book on church administration. Pray for Juan and his ministry through Hispanics for Christ. For more information, visit http://www.hispanicsforchrist.org.